Two objects are in thermal contact when heat energy can be transferred between them. Two objects are in thermal equilibrium when there is no net flow of heat between two objects that are in thermal equilibrium. Two objects in thermal equilibrium have the same temperature. Figure below shows 2 blocks in thermal contact with each other. 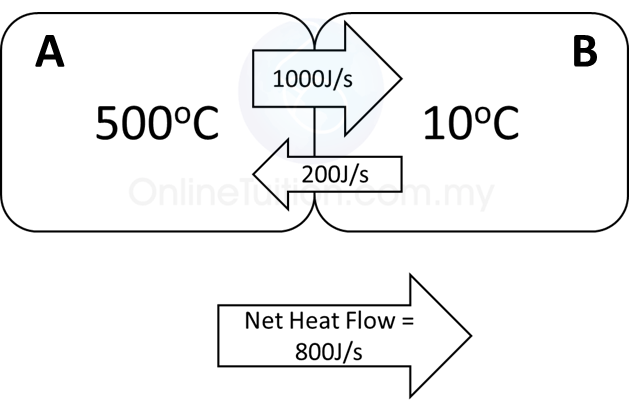 Initially, the temperature of the 2 blocks are different, and there is a net flow of thermal energy from higher temperature to lower temperature. After some time, thermal equilibrium achieved, where the temperature of the 2 blocks become the same, and there is no net flow of thermal energy between the 2 blocks. Initially, the temperature of block A is higher than block B. The rate of thermal energy transfer is higher from block A to the block B (1000J/s). There is also thermal energy transfer from the block B to block A, but with lower rate (only at 200J/s). Therefore, there is a net heat flow of thermal energy from the block A to block B. 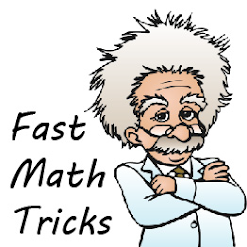 As a result, the temperature of block A decreases whereas the temperature of B increases. The temperature of the 2 blocks become the same. Heat flow is still goes on between the blocks. However, the rate of flow of heat are equal in both direction. 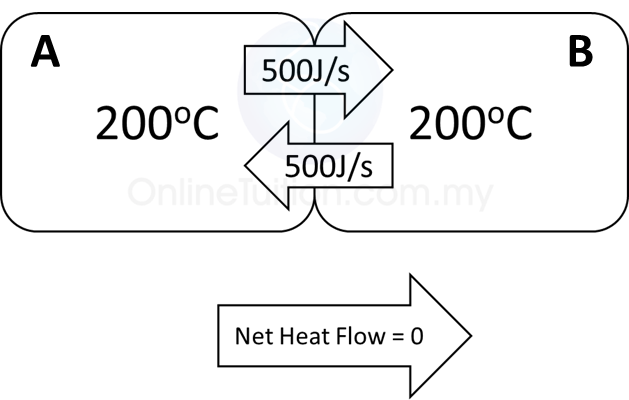 As a result, the net heat flow is equal to 0.